Success in business is often a matter of degrees, finding that unique niche that sets you apart from the competition in a way that is meaningful to potential customers, but isn’t gimmicky. In the category of “I’m not sure if this is cool or silly” I present for your consideration, the bank in a garden. 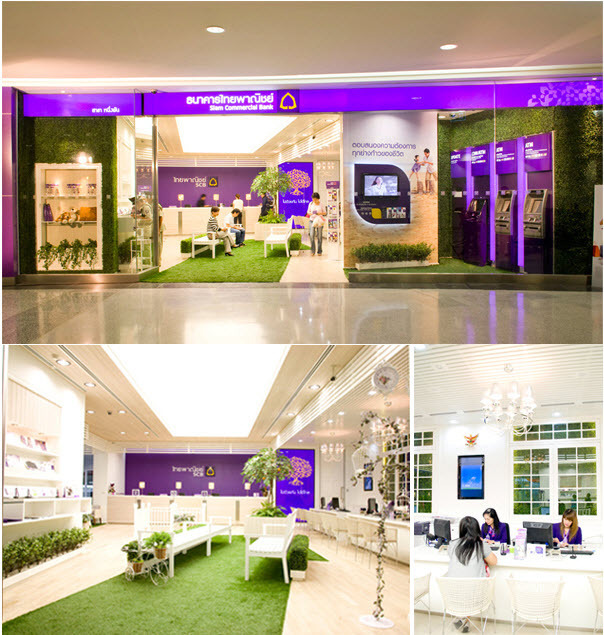 For their 1,000th branch, Siam Commercial Bank (SCB), Thailand’s oldest bank, created what they are calling a “bank in a garden”, a themed branch that has just opened in the newly remodeled Paradise Park mall on the city’s rapidly expanding eastern flank. Paradise Park, which was previously known as Seri Center, has undergone a complete makeover and as part of it, SCB decided to make a big splash in keeping with the new mall’s “Oasis of Eastern Bangkok” theme. I’m all for innovation and certainly banking, which is still largely done in person here in Thailand (which explains why they have 1,000 branches! 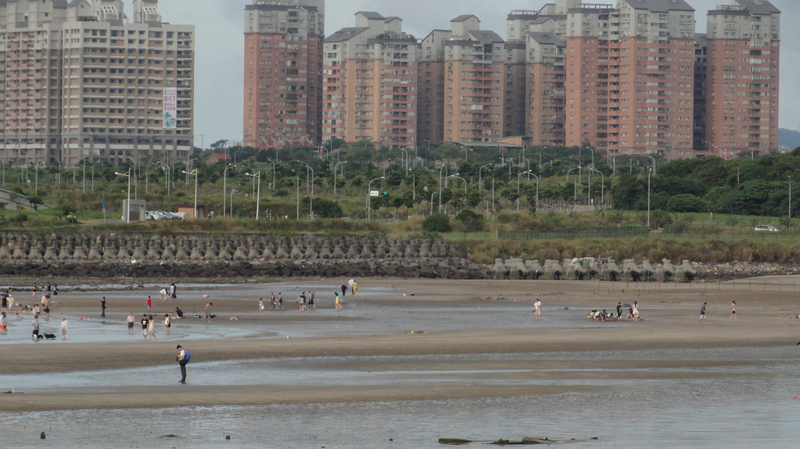 ), is a task that will benefit from nearly anything that can make it more pleasant. But I’m not sure that artificial grass and artificial shrubs and wicker lawn furniture is going to help. Especially in a few months when the fake leaves and blades of grass start to fall (or be pulled) off and the greenery starts to have some bare patches. What are your thoughts? Would you like to have a bank in a garden at your local branch? An interesting article appeared in the New York Times this week about a trend of some coffee shops not offering seating – standing room only – and trying to make the space more about the coffee and the other customers than about hunkering down, plugged into your iPhone, iPad, and iPod. This spurred some thoughts and I beg you to bear with me as I bring them up in the disjointed manner one might expect after having had a double espresso on an empty stomach. Earlier this summer, the Bluebird Coffee Shop in the East Village replaced half its tables and most of the chairs with two counters and a few stools. “A coffee shop should be a place to meet your friends and hold conversations and cultivate ideas instead of — I’m going to get in trouble for saying this, so I have to be careful — instead of sticking your head in a laptop,” said [Bluebird’s owner]. Years ago, just as I was starting university, coffee shops were starting to come into fashion in the US. 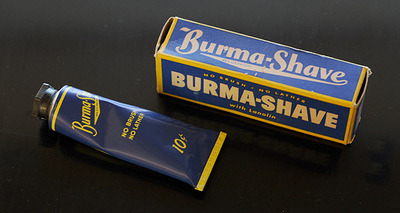 Starbucks was around, although not as ubiquitous as it is these days. I remember reading an in-depth article about the concept of Third Places, an article that contributed to my interest, and my brief majoring in, urban studies. Third Places are informal public gathering spaces that offer a balance between the spheres of home and work, the first and second places, respectively, in our lives. Just as a tripod offers more stability than a bipod, the third place can serve to keep us from falling into a mental trap of “home to work and back again”. 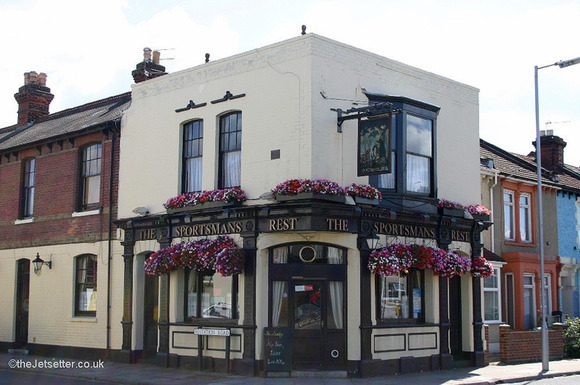 The article, and many like it, identify examples of third places such as the cafe in French culture, the corner pub in the British Isles, and the espresso bar in Italy. Places that serve to anchor neighborhood life. The underlying thesis of the article was that the overall quality of life in a society is better when there is such a third place and declines in the absence of such spaces. Do We Actually Have Third Places? 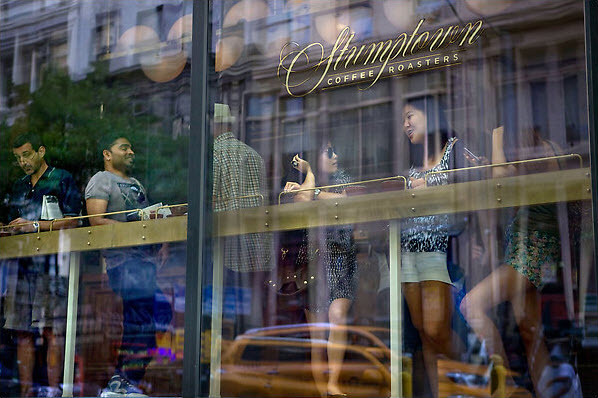 I’ve observed is that we’ve built a great number of spaces that are designed to look like third places – indeed, Starbucks’ founder and CEO Howard Schultz (no relation) acknowledges that as one of the omnipresent chain’s motivations. But these spaces don’t actually function as true third places. How many of you go to a business like Starbucks regularly enough that you know the employees who work there, but don’t know any of the other customers? There are certainly many small businesses within walking distance of my house (including a Starbucks, I type a bit guiltily) where I recognize the staff but none of the patrons. The element that is missing from our pseudo third places is our interaction with our neighbors, the other customers in the place. Some of that may be because the third places we visit are largely outside of our neighborhood, often on the way to (or nearby) work. That begs the question, are they really third places in the true definition of the word? They cannot anchor a neighborhood if they are not in your neighborhood. As an aside, I have to wonder whether the increasing political polarization in the US is due in some small part to this lack of third places in which we interact with our neighbors. When we don’t know our neighbors, much less have the opportunity to interact and converse with them, what hope is there of having a civil dialogue about the issues of the day? What About My Third Places? About a five-minute walk away from my home, at the mouth of the soi (alley) where I live, there is a small corner spot that is a small, failing Japanese bar. It is steps away from the entrance to the Skytrain station, near a busy intersection, and across the street from a private international school. 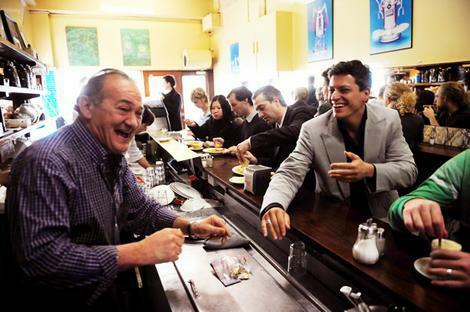 It strikes me that it would be the perfect location for a coffee bar that the NY Times article talks about. Being at the gateway to my neighborhood and just next to a transit station, it would be the ideal crossing path for neighbors. I don’t know if it would work financially – there are a lot of factors at play here – but in terms of being an effective third place, it would be well suited. Another possibility is one of two small retail spots on the street level of my 8-story condo building. It is currently empty but the juristic board says that a lease has been signed for someone to open a small cafe of some sort. That would be an ideal third place, right? Go down for a morning coffee, meet and chat with my building’s neighbors and other people in the neighborhood. We’ll see if it works out like that. Somewhere in my mind, I imagine either patronizing (or owning) a place like the one pictured above. An espresso bar that is crowded with people from the neighborhood, getting their coffee, chatting for a bit, and then going on their way. Somewhere warm and convivial. What about you? Do you have a third place? Do you see an absence of third places in our societies? And what do you think about coffee bars without a place to sit down and plug into your digital devices? 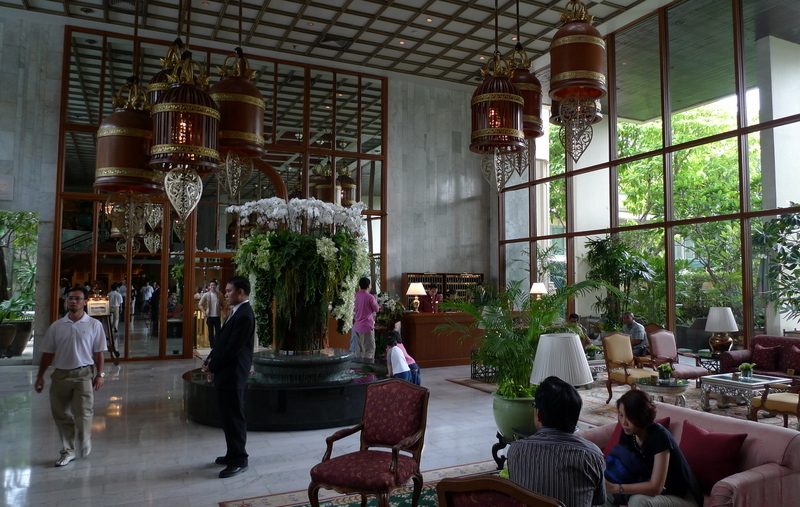 The Mandarin Oriental Hotel in Bangkok, which traces its history to 1876 as the first hotel in the Kingdom of Siam, remains one of the finest hotels in Asia. Its legendary service and refined elegance leaves you half-expecting to find such famous visitors of years past as Somerset Maugham and Noel Coward sitting in the lobby or the colonial-style Authors’ Lounge. 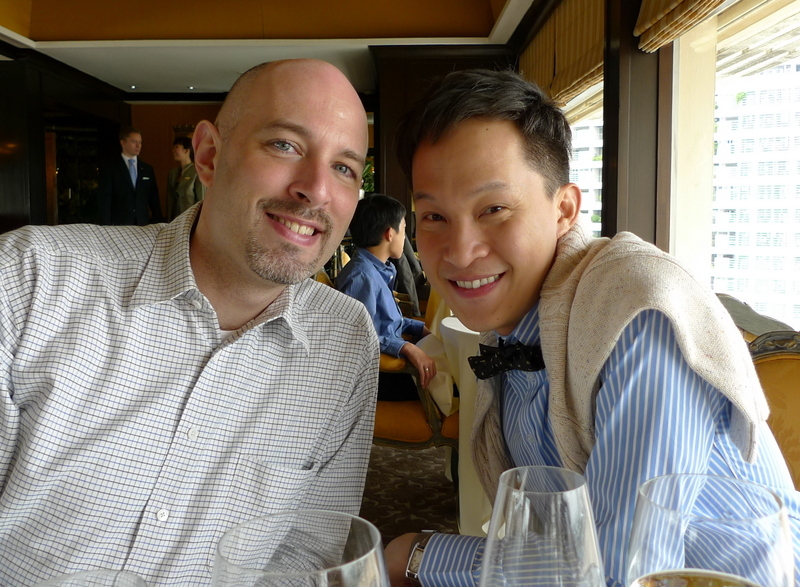 Sitting atop the 10-story Garden Wing, which was home to Thailand’s first elevator (1958), is the most famous French restaurant in town: Le Normandie. It was there that we gathered for lunch Sunday afternoon to celebrate the marriage of one of Tawn’s university friends, Ko. She and her husband Per were married in a civil ceremony in Sweden a few weeks back. He will move here later this year and their Thai wedding celebration, certain to be much more lavish, will be held in December. 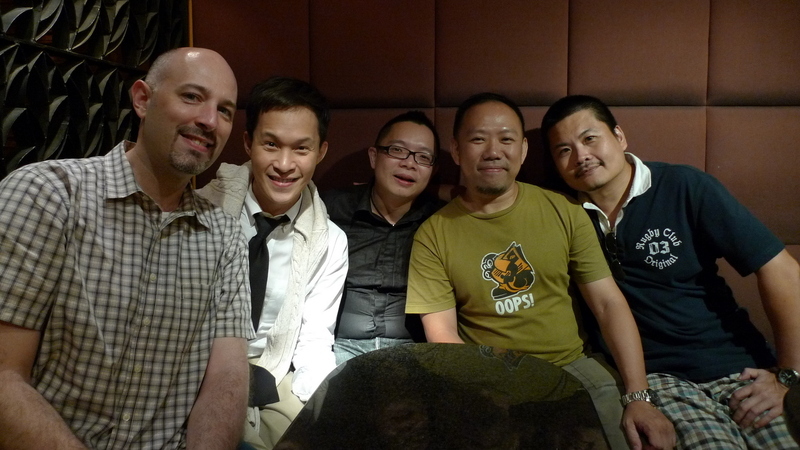 Joining Ko, Tawn, and me was their other university friend, Bim. Both Bim and Ko are foodies, so this seemed as good a place as any to indulge and celebrate. 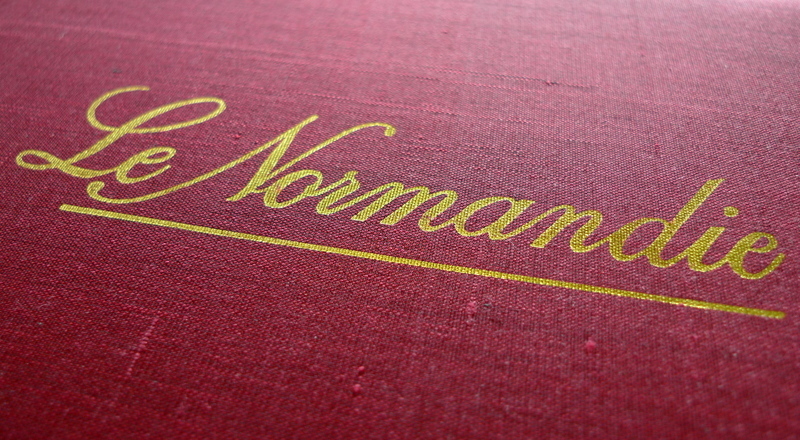 Le Normandie, which is elegantly appointed in buttery yellow silks, mirrors, and fine chandeliers, has a view and a price tag to suit. 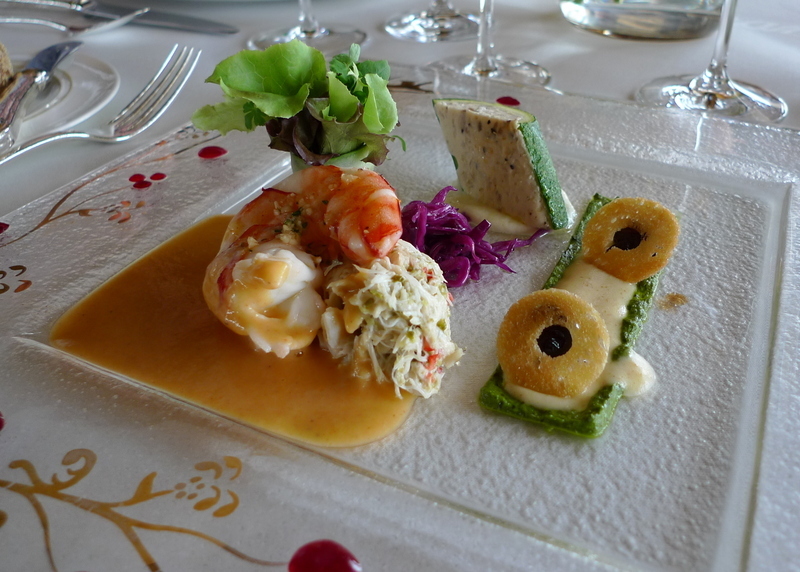 What isn’t widely known is that each summer, which is low season here in Thailand, Le Normandie offers a summer prix fixe menu – this summer only 1100 baht ($35) for three courses. 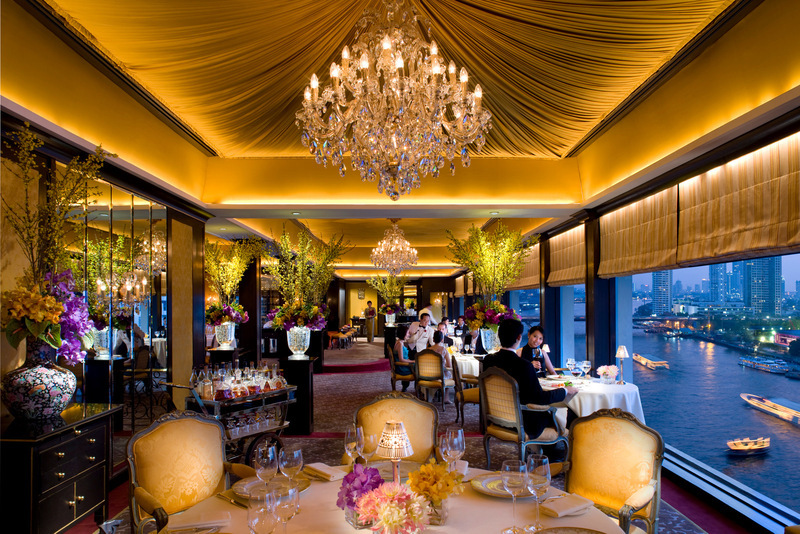 In addition to the beautiful wall treatments and lighting fixtures, both sides of the room have floor-to-ceiling windows offering spectacular views of the city on one side and the Chao Phraya River on the other. 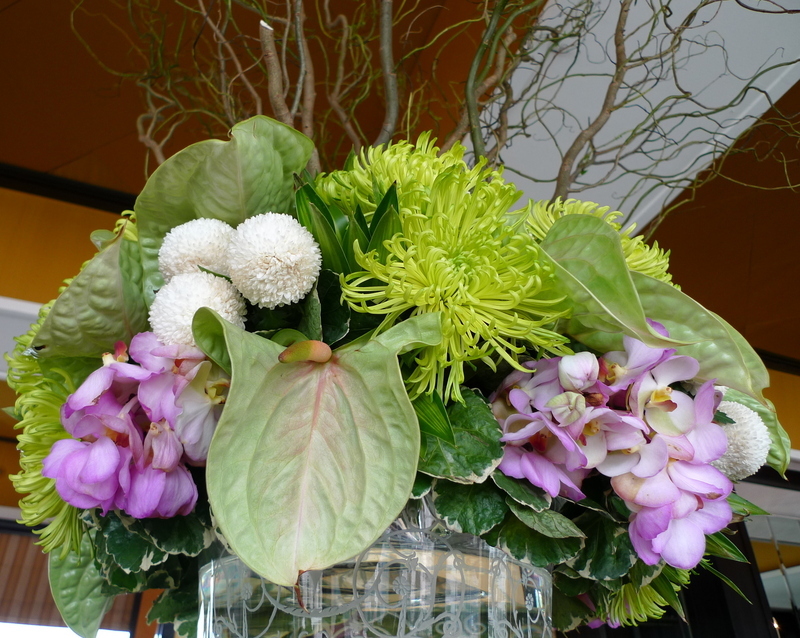 The dining room is decorated with beautiful arrangements of fresh flowers, too. 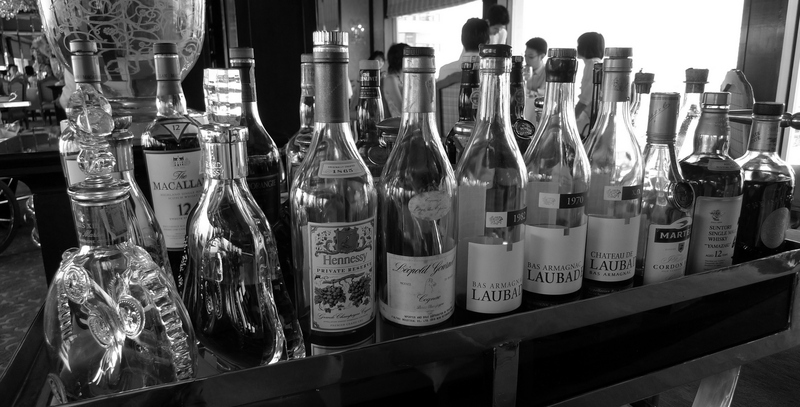 Something that you are paying for at Le Normandie is the service, which is every bit as prompt and attentive as you would expect in a fine restaurant in Paris. 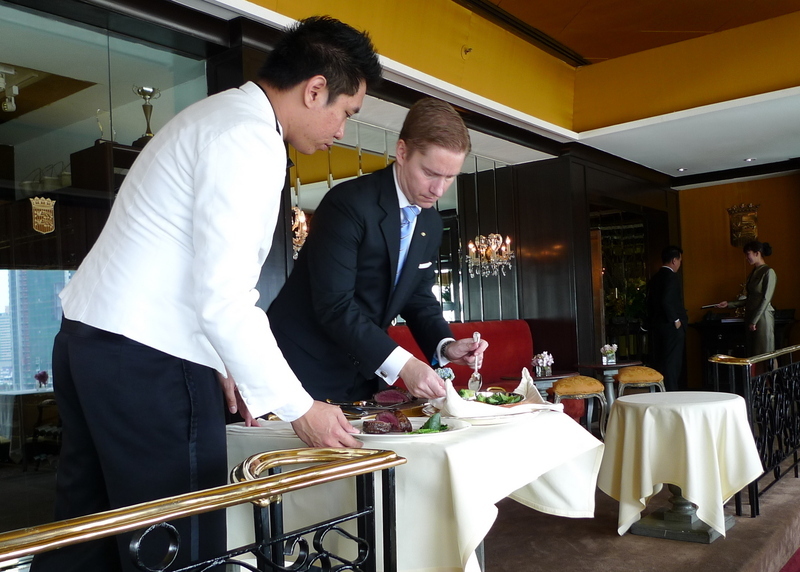 The roast is carved tableside, plates are placed at the table simultaneously by the waiters, the proper utensils are discreetly placed on the table between courses, etc. Living in a city where most of the fine dining restaurants struggle to get the diners’ main courses to the table within ten minutes of each other, having the plates gently placed on the table at the same moment is a thrill! Fresh breads of all sorts were brought before and throughout the meal, a variety of brioche, whole grain bread, sourdough, baguette, etc. that were freshly baked that morning and served warm. 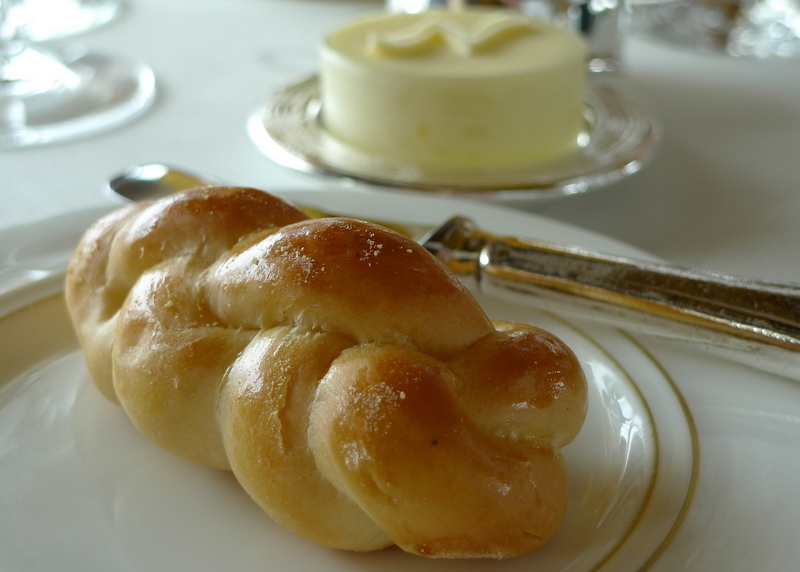 The butter was molded with a italicized “N” on top, served in a proper glass dish with silver lid. After ordering, the chef sent an amuse bouche to tease our appetite. Sorry that the focus on the right isn’t sharp. 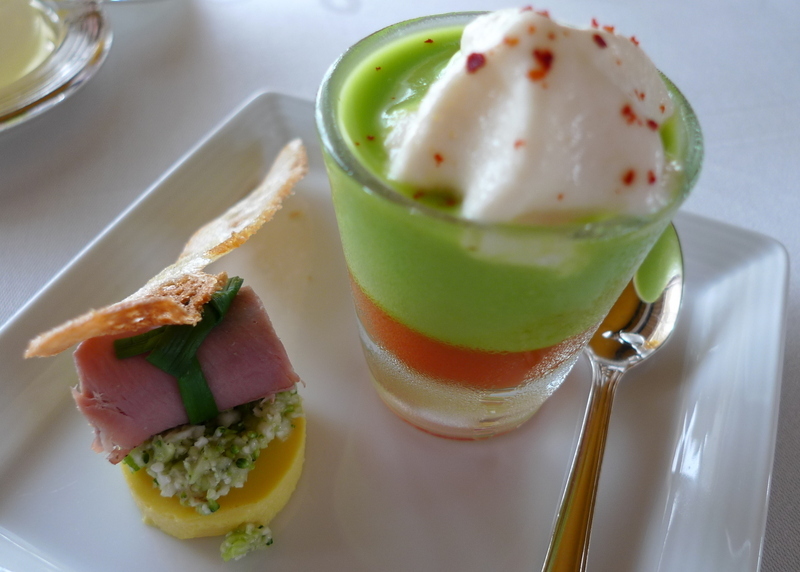 The shot glass is a tomato jelly with avocado soup and a passion fruit foam. On the left is a slice of squash mousse with broccoli salad topped with a roll of chicken mousse wrapped in thinly sliced duck breast. Yummy! Tawn and I both ordered this beautiful dish: buisson d’asperges vertes, crème aux graines de pavot, œuf de poule prise en gelée, tartare de légumes safranés , which is a “buisson” or pile of green asparagus with poached egg, poppy seed cream, and saffron scented vegetable tartar. 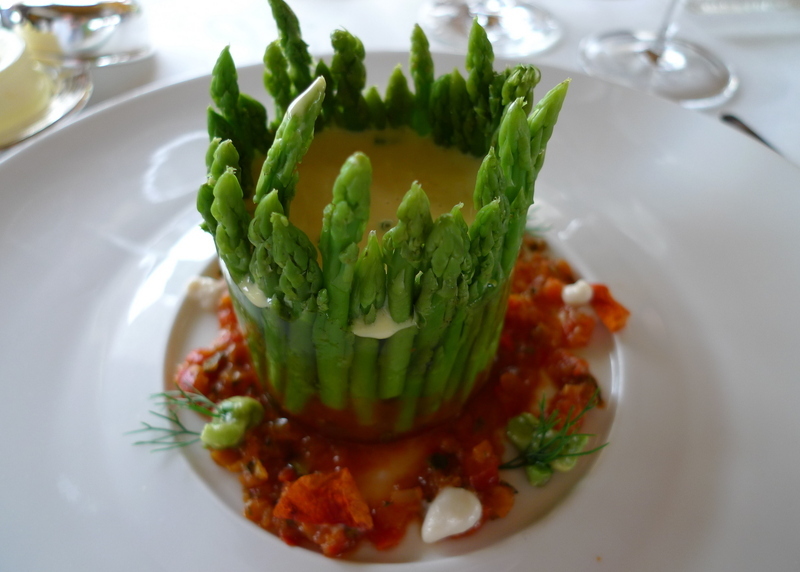 Translating that further, that base was formed of asparagus spears set upright in an aspic, or gelatin, base. 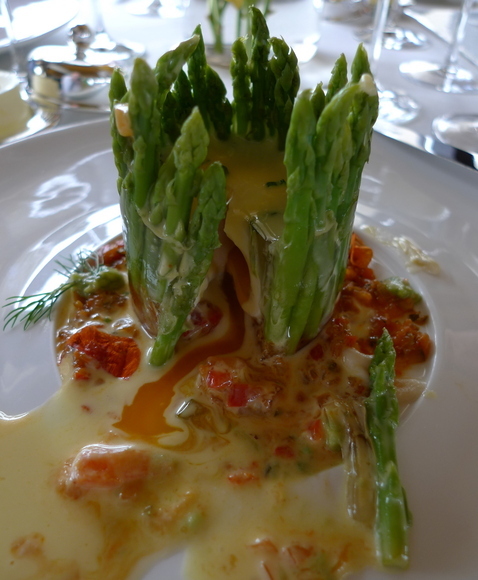 The poached egg, served cool but with a runny yolk, was inside the “crown” of asparagus and held into place with a little more aspic. The vegetables around the base were mostly tomatoes and pepper and had a nice saffron aroma. Once the plate was served, the waiter came over with a sauce dish of warm poppy seed cream and spooned it into the center of the crown. When I cut into it, the cream and egg yolk came running out in what was both an amazing, and an amazingly beautiful, mess. The dish was really nicely prepared and what was especially pleasing about it was the amount of effort and technique that had gone into it. It was a good example of the elevation of food to art. Ko ordered esquinade d’araignée, courgette et salicoque e la vapeur, émulsion au chorizo, which was a spider sea crab meat with poached prawn and zucchini, served with chorizo sausage sauce. 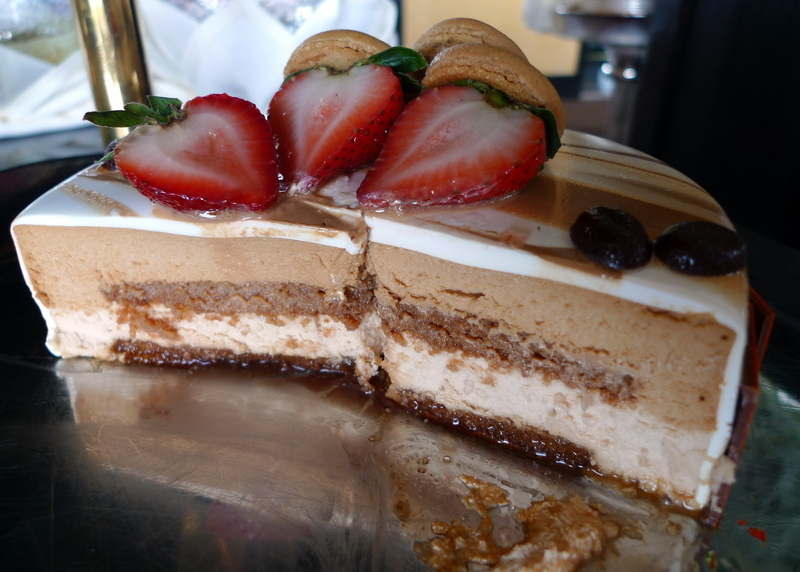 I didn’t try it but she said it was very nice. Beautiful plating, too. 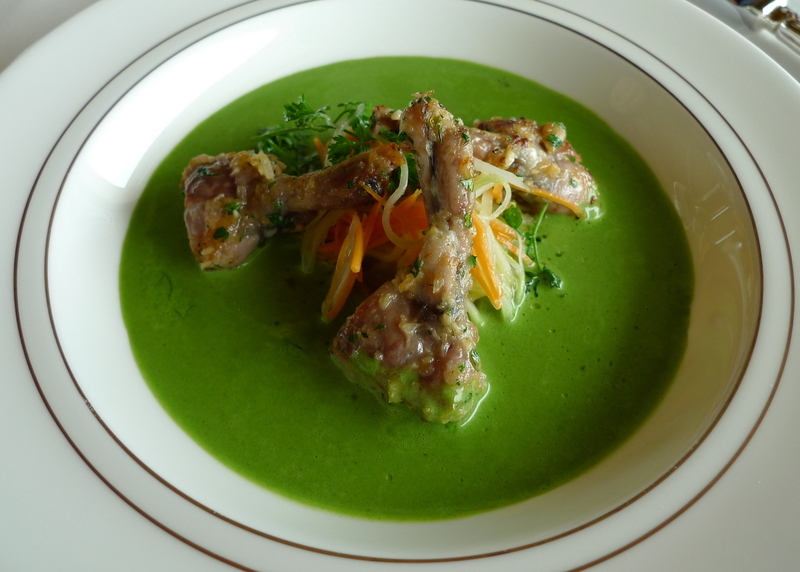 Bim ordered the vibrant green cuisses de grenouilles en fricassée, raviole Provençale, parmesan et sherry Tio-Pepe – a frog leg fricassee with Provençale ravioli, parmesan and Tio-Pepe sherry sauce. She really enjoyed this dish. 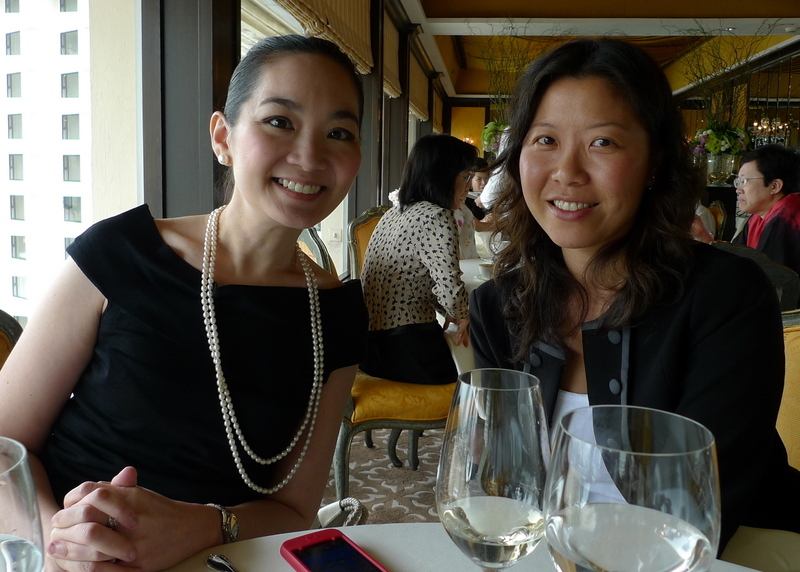 Between courses, here are the beautiful and intelligent Bim (left) and Ko (right). While there were many other friends who couldn’t make it, I can’t imagine anyone who would have been better to enjoy this meal with. The main courses were just as artful and tasty as the entrées. Bim and Ko both had the filet de Saint-Pierre confit, croustillant de lard Ibérique a l’abricot et jus a la vanille, which was a John Dory fillet with apricot wrapped in Iberico ham and a vanilla-berry essence. Tawn had the cabillaud à la Boulangère, vin de Jura, cappuccino des sous-bois et sauce au café , which was cod fish Boulangere style with Jura wine, forest mushroom cappuccino and a coffee sauce. 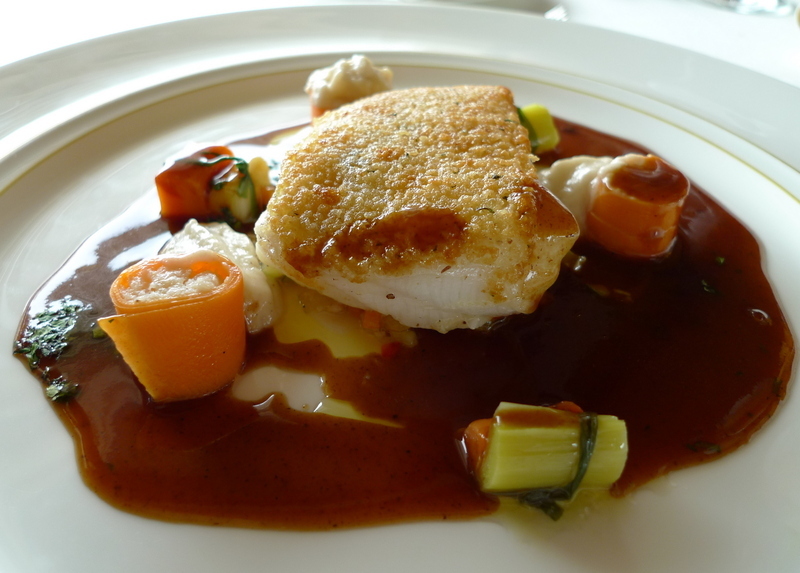 The fish was beautifully prepared, moist and flaky. The sauce was interesting as it had just the faintest hint of coffee to it. 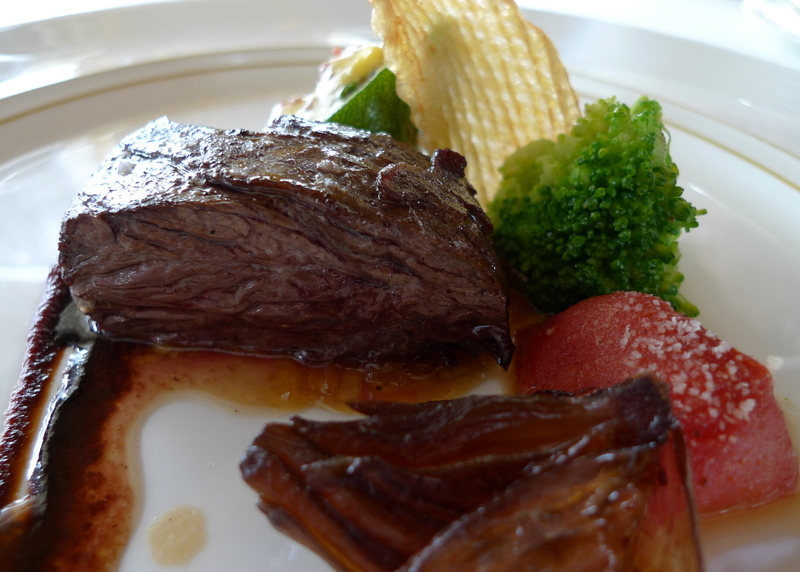 I didn’t stray far from convention, enjoying a flavorful pièce de bœuf rôti, gratin de tomates cerise, échalote en chemise et sauce au poivre, or roasted beef with cherry tomato gratin, shallot and pepper corn sauce. It was very tasty. 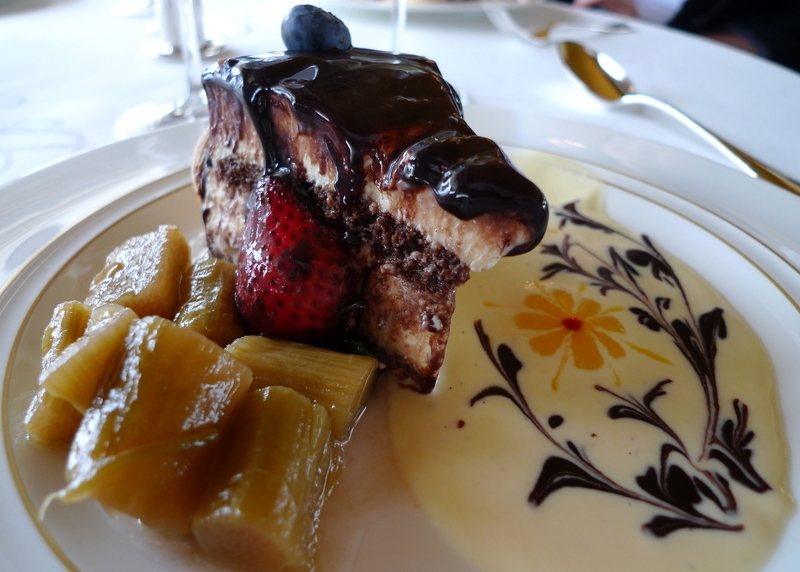 After the main course, the dessert cart was rolled over, featuring a half-dozen types of cakes and four stewed fruit compotes including fig and rhubarb. 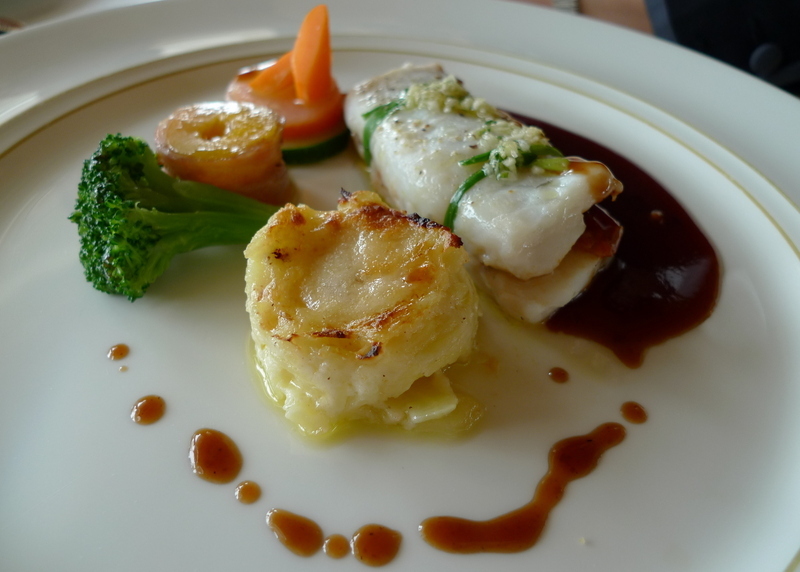 We could choose two selections and the waiter prepared each plate, saucing and decorating it differently. It took about five minutes per plate but the results, as you can see below, were beautiful. My marscapone cheese cake with vanilla sauce and rhubarb compote. 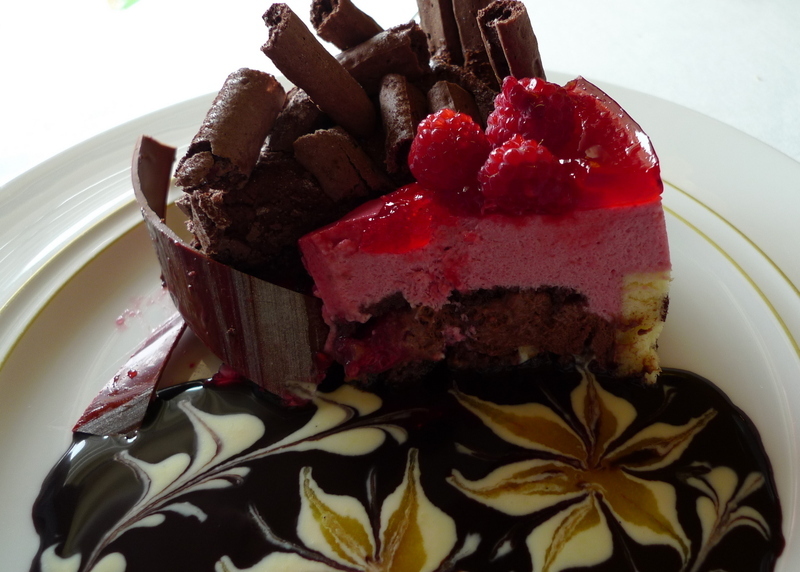 A raspberry mousse cake and a chocolate cake – Tawn’s selections. 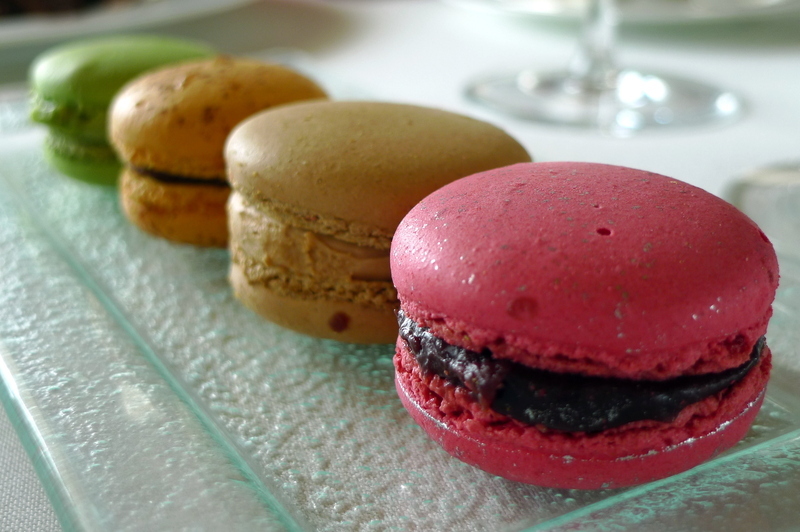 While tea and coffee were served, two trays of beautiful and tasty macarons were served: chocolate-raspberry, caramel, chocolate-orange, and green tea. While we didn’t partake of them, there was a cart loaded with fine after dinner drinks. I’m not a brandy drinker, but there is something about an after-dinner drink that seems very refined. 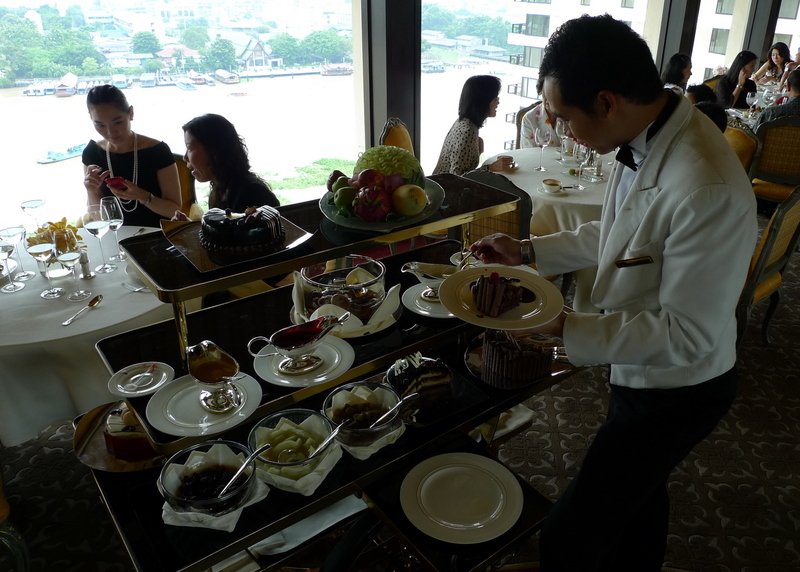 After an enjoyable, nearly three hour dining experience above the banks of the Chao Phraya River. What an elegant and pleasant way to celebrate a friend’s wedding. If only her new husband had been there to enjoy it, too! 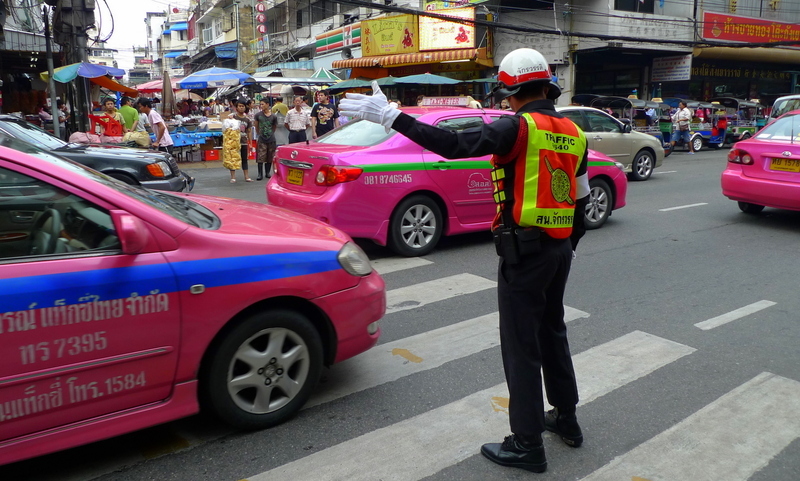 Like so many cities around the world, Bangkok has a sizeable Chinatown. Over the past few hundred years, the Chinese has become very integrated into Thai culture and many Thais, including His Majesty the King, have Chinese blood in their veins. 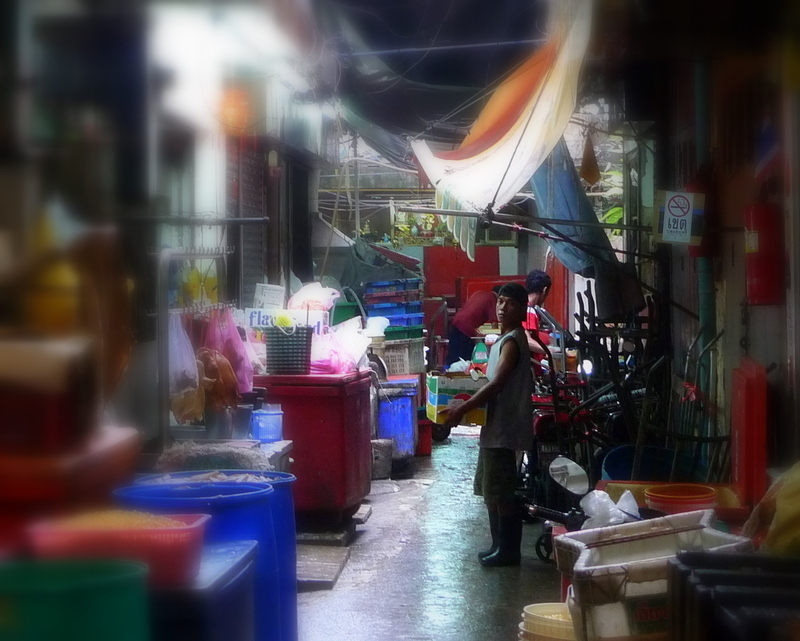 This is especially true of the merchant families, as a trip to Yaoworat – Bangkok’s teeming Chinatown – illustrates. 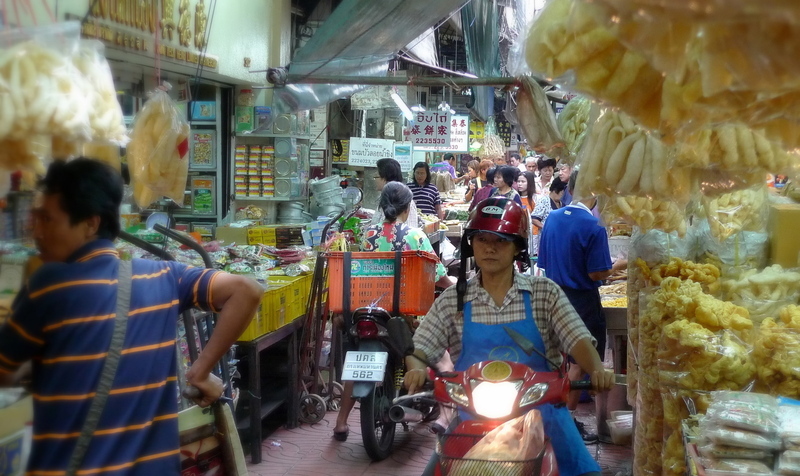 I had the opportunity this past weekend to join Tawn and his boss for a early morning shopping trip to talat gao – the old market. 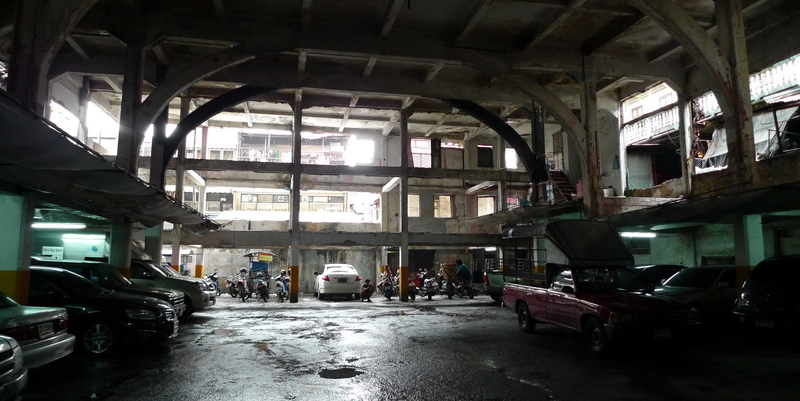 We parked in a gutted theatre that used to stage Chinese operas. It is interesting as the arches mark the boundaries of the original hall and the backstage area would have been where the white car is parked. The walls have been removed for ventilation, leaving only the columns and beams. The neighboring balconies and windows now look in on the car park. 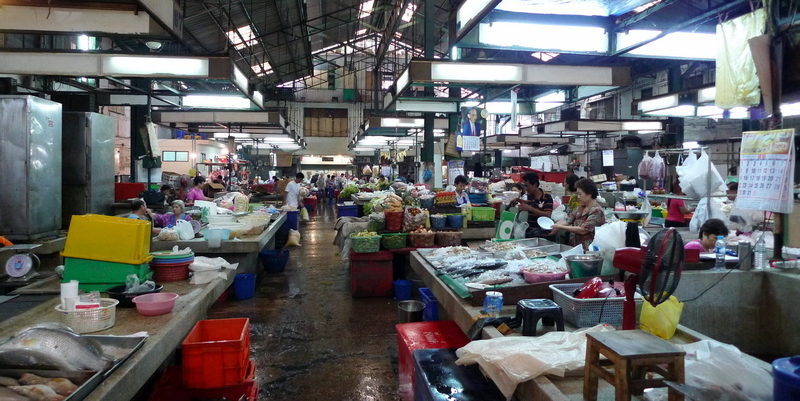 The old market area is a wet market – meat, seafood, and vegetables – located off the street. It is crowded early in the morning but by 8:00 when this picture was taken, the customers are clearing out and the vendors are shutting down. This is where Tawn bought a lot of seafood including fresh lump crab meat for one-quarter the price we would pay at our local market. 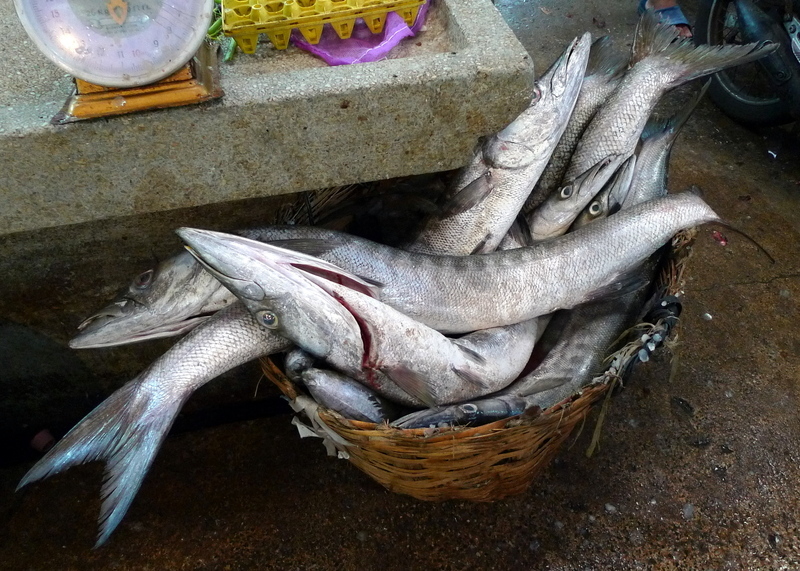 There was still a large selection of fresh fish around, including what I believe are baracuda in a basket. 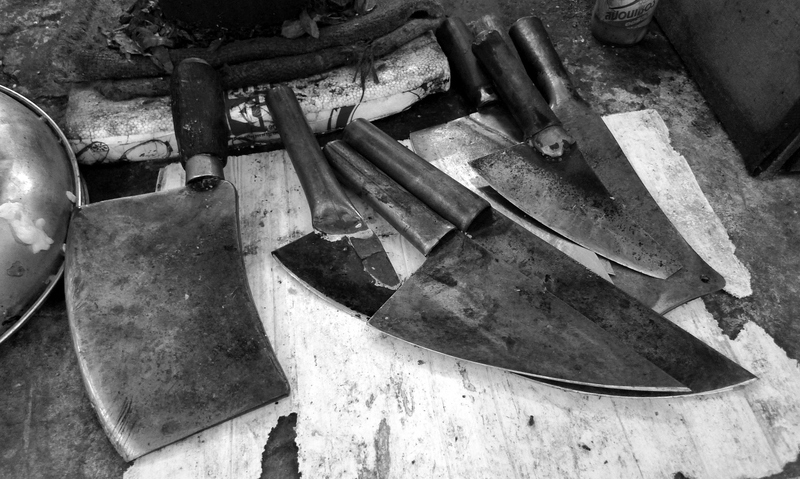 The knives used in the market show their age, having been sharpened thousands of times. Reminds me of the show Sweeney Todd, the Demon Barber of Fleet Street. 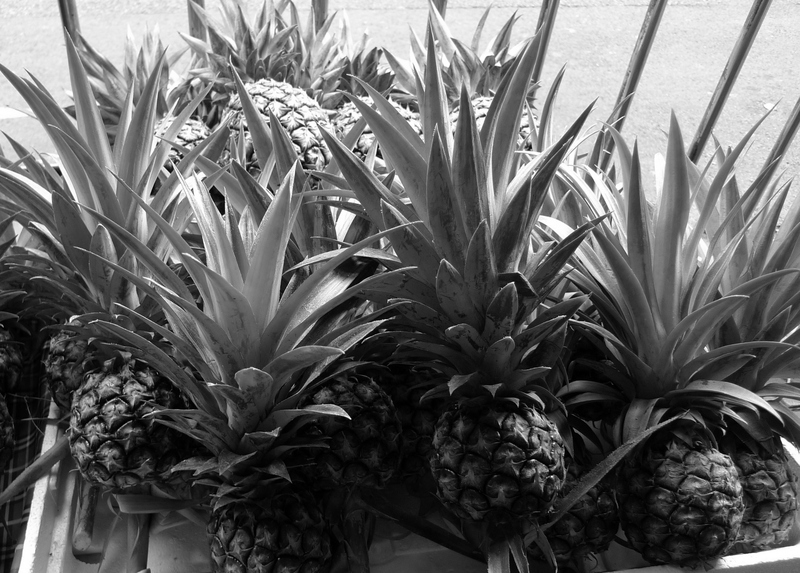 The market has vibrant colors and interesting openings where natural light comes flooding in. It is a place where you need to be paying attention, with lots of people passing through carrying boxes, pushing carts, and riding motorcycles stacked high with deliveries. On the opposite side of the street, we explored some of the new market, which focuses more on dry goods and prepared foods. Any guess what are in all those bags? Fried fish swim bladders, also known as fish maw. 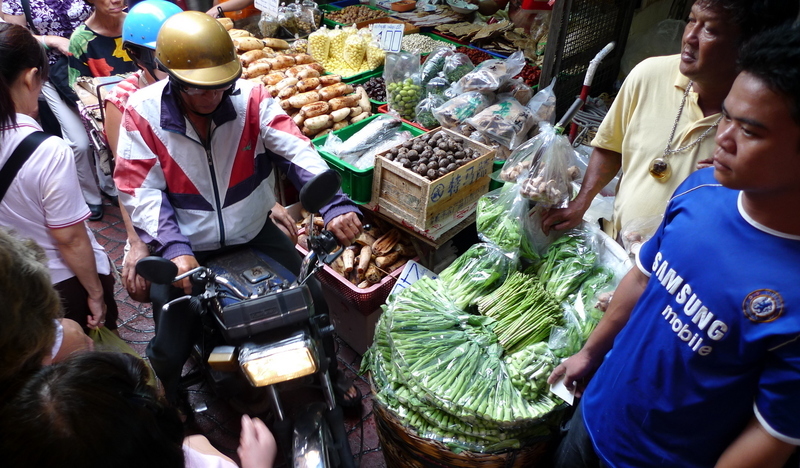 Tight quarters in some sections as motorbikes and pedestrians create traffic jams. 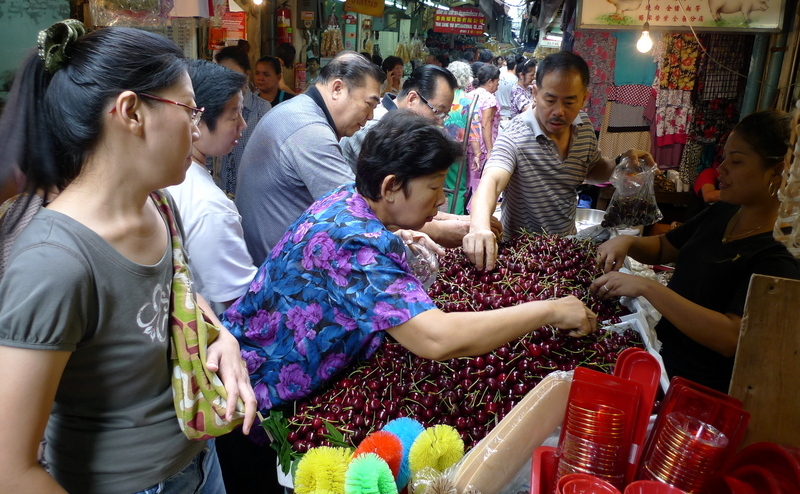 A mad rush for fresh cherries! The vendor also sells toilet bowl brushes in a variety of colors. 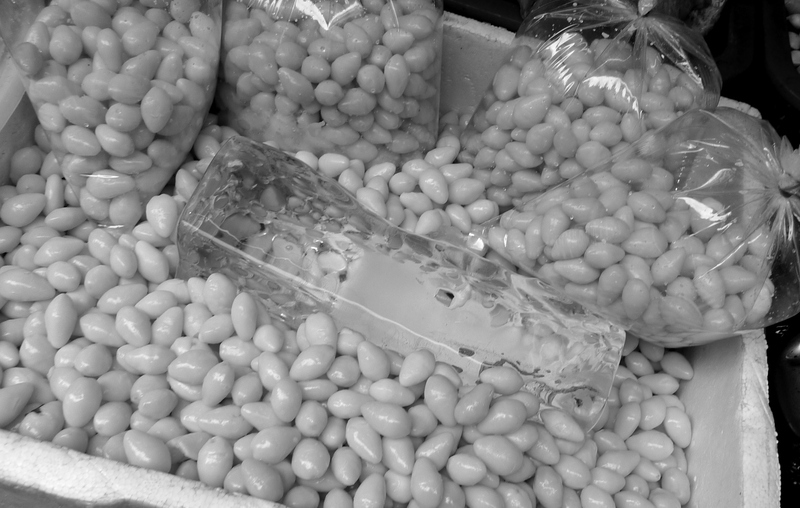 Ginko nuts on ice. Very nice sweetened in a little sugar syrup and added to my morning oatmeal. Plus, they are supposed to be very good for your kidneys. Freshly shaved pig’s head. You don’t want any bristles before serving this to guests. 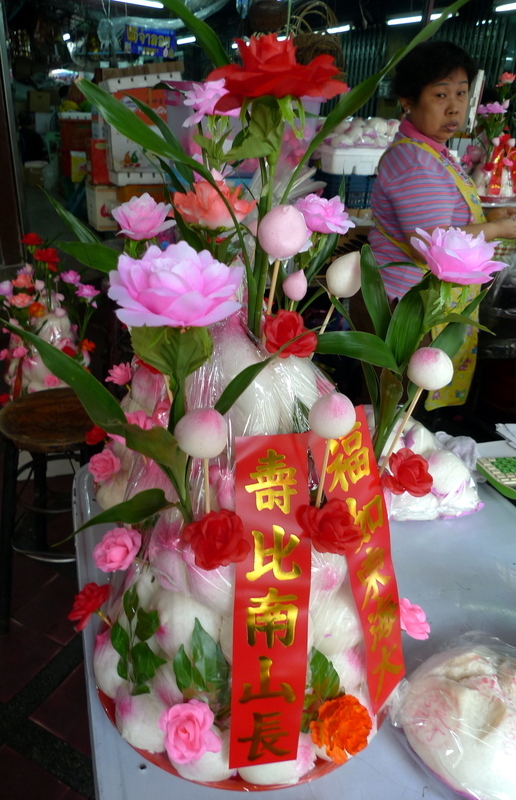 Chinese buns are stacked as part of a good-luck offering. 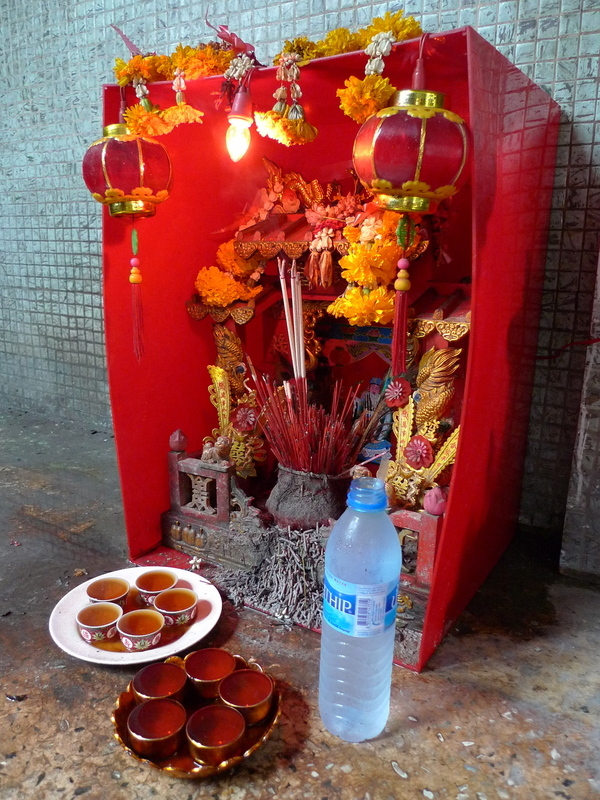 A Chinese shrine located in the car park with tea and water left for the gods. Note the mound of incense stick ash that has built up at the base of the shrine. 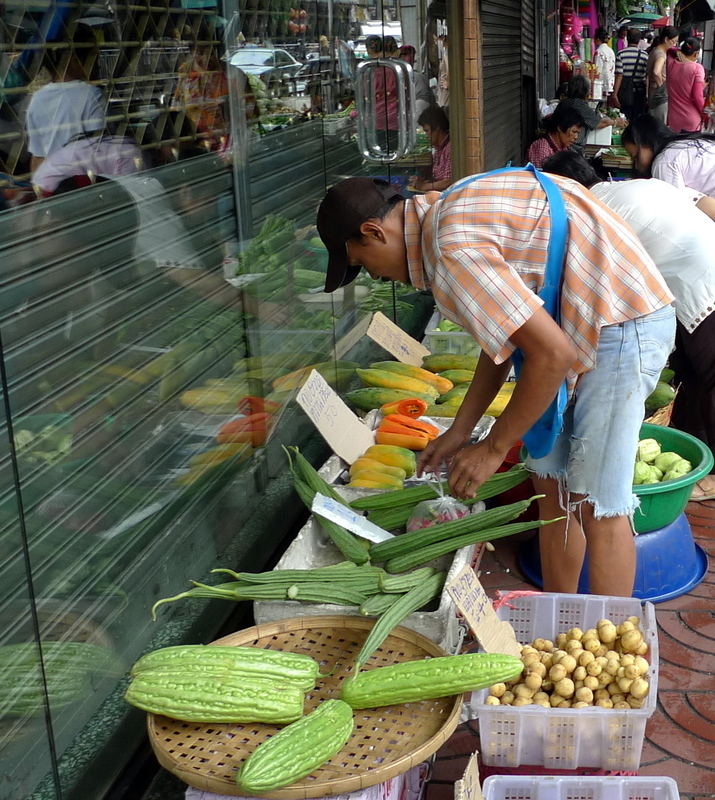 Outside the new market, makeshift vendors line the sidewalks in front of shops that have not yet opened for business, selling whatever items are from their farms (of their relatives’ farms) in the nearby provinces. 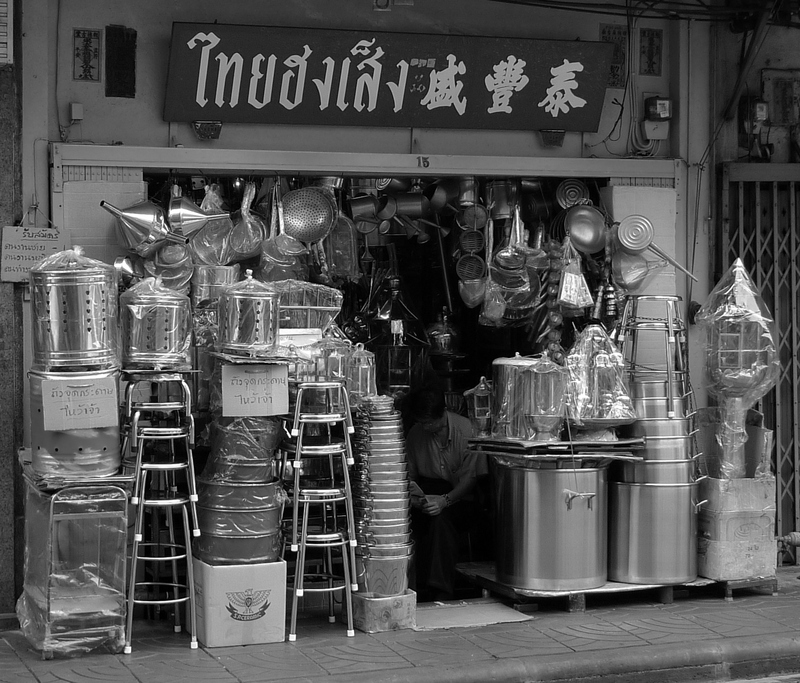 On a nearby street, a shop sells all things steel, from containers for burnt offerings (far left with holes in them) to stools to buckets, to huge stock pots, to funnels, to an oil lamp for use at shrines (far right, wrapped in plastic). Regarding my earlier comment that many of the merchant families in Bangkok are Chinese, you see signs of this all the time – literally! Notice that the shop’s name appears both in Thai letters (left) and Chinese characters (right). Very interesting is that right between the two are some markings made by Buddhist monks to bless the shop. I’ll have to do a close-up of that one of these days and explain it in more detail. 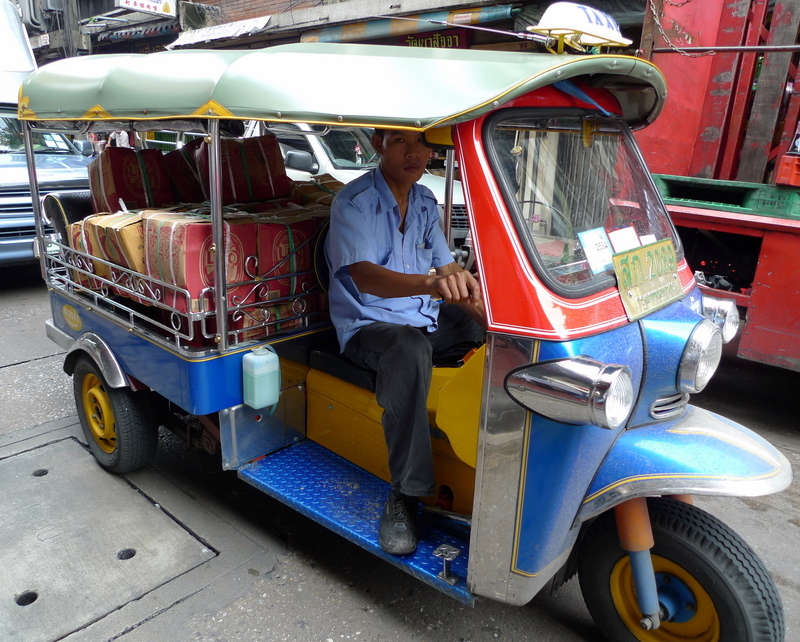 These three-wheel tuk-tuks, when not gouging tourists, haul bulk goods (usually with their purchaser, although not in this case) around the city. 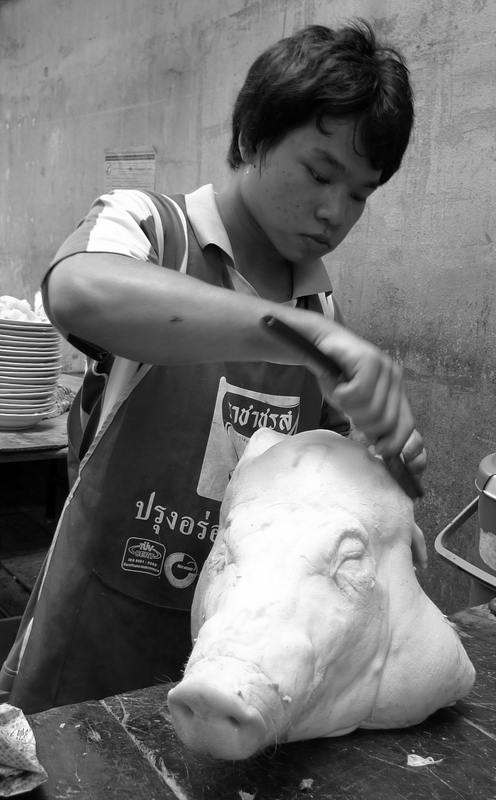 Getting hungry, we stopped by a fastidiously clean, freshly painted shop known for its muu daeng – literally “red pork”, which is the barbecue pork often known by its Chinese name charshu. This man is the owner. Signs in the building proudly announce that he is now 82 years old and has been in business for 61 years. 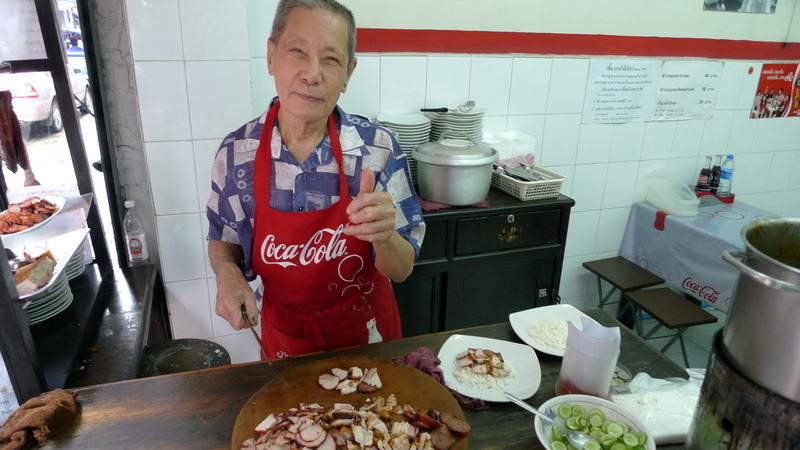 There’s not much else he serves but the rice or noodles with barbecue pork on it. 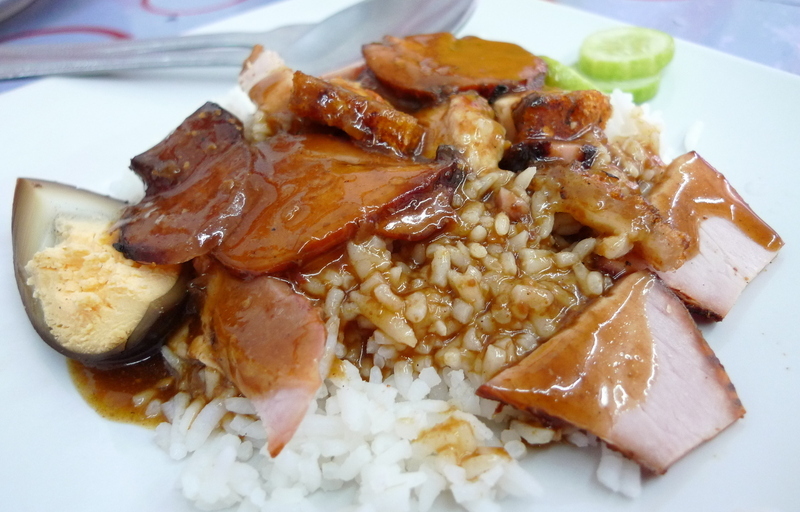 This is a plate of “two types pork” – one barbecued and the other roasted with the crispy skin on it. The sauce, unlike that of many competitors/immitators, isn’t super-sweet and has a complex flavor to it. He serves it with a slice of soy sauce boiled egg (not the “100-year old egg”) and some slightly sweet pickled cucumbers. Wonderful, all for about US$1. So that was my morning trip to the market. We were home by 10:30, a bit exhausted but with a lot of seafood and other good buys. I hope you enjoyed coming along for the ride.